Someone who is still away for the Easter break may be coming home to find themselves £14,262,549 richer. National Lottery bosses at Camelot say they are hoping the reason Wednesday's huge jackpot has not yet been claimed is because of the holiday period. All players are urged to check if they are the single ticket holder with the winning numbers - 1, 3, 22, 32, 38 and 44 - for 14 April's main Lotto draw. Camelot said: "It's unusual that they haven't come forward by now." 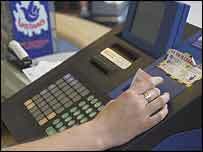 A Lottery spokesman told BBC News Online large jackpot winners were usually on the phone within a few hours. "They might be on holiday, we are hoping they come forward soon. "In the meantime everyone should be looking for their tickets and checking behind the sofa," he said. The ticket holders have 180 days to claim the money. "But given the size of the jackpot it's unusual that they haven't come forward by now. "This would be one of the biggest wins we have had." He said the company would not disclose at this stage the area in which the ticket was bought, due to rules for protecting winners from being identified. The area cannot be identified until 25 days after the draw. Unclaimed prizes go to the lottery's Good Causes fund, which goes into arts, sports, charities, heritage, and millennium projects and education, health and the environment. The current top 15 unclaimed prizes in the main Lotto amount to more than £4.5m. One ticket holder from Scotland has until 21 June to claim £1m won in the Christmas draw. The biggest prize that can still be claimed is £1,458,411, which is waiting for a jackpot winner who bought their ticket in Ealing, West London. Among the winnings never claimed, the biggest was a £3,011,065 jackpot.